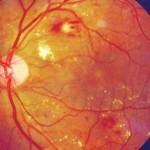 Diabetic retinopathy refers to changes in the retina (the back of the eye) caused by diabetes. Eye doctors check for retinopathy by dilating or enlarging the pupils with drops. Here’s 5 questions and answers that define and characterize the disease.